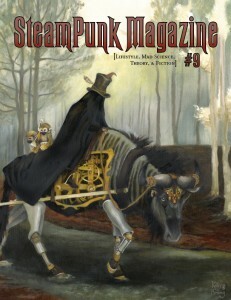 Steampunk Magazine » Issue 9 Giveaway! Issue 9 is about to hit the presses! (Check out the cover art, by the amazing Kelley Hensing.) To celebrate that, and having just passed 6,000 followers on our Facebook page, we’re holding a giveaway! Comment on this thread to enter the giveaway. Entries will close on Monday, Feb. 18th, at noon (EST). One entry per person, please; a valid e-mail address is required to enter. Two entries will be randomly selected for prizes! The Steampunk Magazine anthology (including issues #1-7,) Issue 8, and the upcoming Issue 9! A copy of Issue 9! Because of shipping costs, we can only accept entries from the United States. Sorry! Tres spiff! This must be tweeted. Very nice work by Kelley Hensing with the cover art. Also thanks for the awsome magazine! One thing I have to say though…I’m not a big fan of the title font of the magazine. Otherwise great job with the layout. I’ve been looking at the anthology for a while. it’d be awesome to win! The Mechanical Bull-man in black. Super excited for a new issue, the chance to get one free is a double-bonus. Well done guys. That looks terrific. 6000 followers is only the first step of a long and challenging stairway. An excellent cover and an excellent contest – I’d love to win! Thanks. Congrats on 6,000, looking awesome! I can hardly wait for another dose of Steampunk goodness. Accidently posted comment on another thread! At the risk of appearing redundant I submit here as well :). Mahalo nui for your collections of written curios, giving us a fantastic world in which to delve! Great contest and awesome cover art. I love this magazine and would love to win. Thanks for putting out a great magazine and PLEASE keep up the excellent work. Thanks for your consideration. Can’t wait to see the new issue. Great cover art. You are followed by people from countries other than US or UK,. Can that people participate in this giveaway too? At the moment, I’m afraid not – the shipping is too expensive. But we do know we have a lot of international readers, and are thinking about ways to make sure they’re included in future events as well. An anthology of the first seven issues is an excellent idea; and I would very much like to win it! I am very much looking forward to the new issue.The cover looks great! Hope springs eternal…I’d love to win the anthology. But, if not, I look forward to issue 9, and you will get a letter of comment on what I read and see. At long last, Issue 9! Would love to win full size issues….my printed copies are nice but do the work no justice. Can’t wait to see issue 9. From the cover it looks to be as good as all the others. Wow, the anthology sounds wicked; wouldn’t mind getting my hands on it, contest or not! Cool art. Click on her link for more. I love Fox Spirit, Idol and Pawn Shop. Grad student conducting research on Steampunk literature! Enough said! Just so you know, the contest has been over for a while now. But all our magazines are free online on the “Downloads” page, so please check them out! Just discovered this wonderful gendre and your lovely magazine!